Maintaining your WordPress website is very, very important. There are a lot of moving parts with your website, including your theme, (multiple) plugins, the core of WordPress, as well as your hosting server. Regular maintenance is essential to keeping a well-kept, secure, and smoothly running website. Would you drive your car on balding tires? Or never get an oil change? When the fuel light comes on, you fill it with gas right? Same needs to be done for your website. Maintenance is key to preventing issues! Now you might be wondering what needs to be done to properly maintain your website. There are four things that I deem essential. You can read them below. Backup backup backup. MULTIPLE backups. This is so essential. Before you do any other maintenance, you’ll want to have a backup of your site in its current state. This ensures, if something goes wrong when you do any updates, you can always go back. Luckily I can count on one hand how many times clients have run into issues and didn’t have a backup, but, trust me, it’s so much easier when you have one. One important note here: do not just rely on your hosting provider for backups. If they have them, great! That can be your Plan C when all else fails. Why? They may not keep a full backup (database and files), they might not keep many versions (site went down last week, but they only have backups for the last two days…), or it could be really tricky to restore (downloading a bunch of files and reuploading them is time-consuming and NOT fun). I always am on the side of having more control, meaning if you have your own backups, you’re in control. I always recommend having multiple backups but it really depends on how often you visit your own website. If you only check your site once a month, then you’ll want weekly backups for a month. Why? Because if you happen to check your website today and there’s an issue, but you have no idea when that issue occurred (because the last time you checked the site was last month) then a backup from yesterday may not help. It’s possible the issue started two weeks ago and you’d need to restore your website from a backup prior to two weeks ago. Now if you’re checking your site daily, then you probably only need 2 or 3 daily backups since you’ll notice an issue a lot sooner. 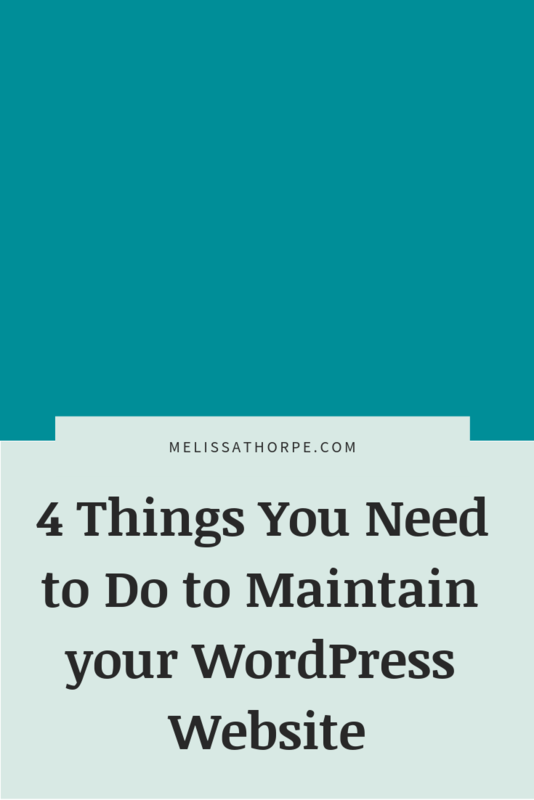 This includes updates to plugins, your theme, and the core of WordPress. On your WordPress dashboard, you’ll see an orange circle with a number telling you how many updates are available. This is your car’s check engine light. You could ignore these updates and risk security issues or conflicts between your theme, other plugins or WordPress. But you don’t want that do you? I recommend checking updates and doing them at least once a week. You’ll want to run these updates 1-by-1 so if there’s any issue, you’ll know what causes it. DO NOT run the updates all at once. Especially if there’s 13 like in the image above. Chances are things will be fine BUT if something isn’t fine, it’s going to be a LOT harder to figure out what caused the issue. Run a single update, check your website and make sure things are working. So, for example, if you update your Forms plugin, then go check that your forms are still there and work correctly. I recommend doing plugin updates first, then theme and then WordPress core. Why? Because if WordPress updated a function or deprecated a specific way of doing things, you want those plugins to be updated first to they work when WordPress is updated. Did you know every time you edit a page or post, WordPress saves the old copy as a revision? That way you can reference the older copies, like say in case you accidentally deleted a paragraph or something. But, the problem is, those revisions can take up a lot of space in your database. And the larger your database, the slower it can become. Enter database optimization. This will remove the unnecessary clutter and keep your database running smooth and fast. You’d like to be protected from hackers, right? Did you know the WordPress login page is one of the most attacked pages? 99% of WordPress websites use the default login URL, so spammers can easily head to that page and use a bot to try and guess your login. Speaking of login, how secure is your password? If it’s just letters and numbers, it’s probably not all that secure. These days, you need special characters, randomization, passwords that can’t be pronounced, and lengthy ones too! This is even more important if you have users registering for your website. You don’t want your website to be vulnerable because of an insecure password by a member, do you? Curious how to best go about keeping on top of these maintenance requirements? Download the free PDF below where I give you plugin recommendations! Want some maintenance plugin recommendations? Exactly! Very nice info you gave us in here =) I totally agree with your 4 steps. Best regards!